The book reveals the truths behind the conventional images of three of Great Britain's primary military leaders during and immediately after the Second World War. In each case there was a totally different side to each man, which demonstrates that a great deal of their reputation was built on contrived results, deception and dishonesty. It examines the influence and impediment of "class” on the performance of the British Army in World War II, and quotes the views of the Americans that far too often there was an unwillingness among the British to base officer promotion on effectiveness rather than on social background; conforming was more important than performing, as anyone who has served in the British Army's ranks would agree. At the same time, Montgomery feared and was jealous of Patton, whose rate of advance was nearly always twice that of Monty's. The services of Field Marshals Wavell and Auchinleck, two of Britain's finest commanders of the war, were largely lost to Britain because of Churchill's consistent interfering in field matters and his need to contrive almost anything to remain in power after he had been responsible for the fall of Singapore. 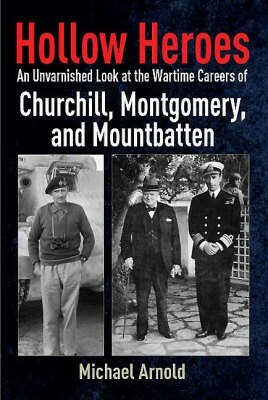 This book includes the bizarre case of Major-General Dorman-Smith, one of Britain's most brilliant original thinkers, who without reason was sacked by Churchill. Dorman-Smith was the tactician who had produced Britain's victory over Rommel at the first battle of Alamein, but his crime seems have been overachievement; an unforgivable sin in some eyes. Mountbatten's fumbling in India is also realistically portrayed in these pages, putting paid to the "man for the century's” overly embellished reputation. Chapter 3 Montgomery—Military Messiah or Army Arriviste? Chapter 14 World War II without Churchill? "...the author offers a fresh perspective anchored in a critical approach to shatter some preconceptions. Arnold asserts that much of their glowing reputations were built on drummed up results, deference to social class and deceptions cloaked by wartime propaganda and favorable news coverage. His well-written narrative weighs claims of greatness against actual achievements... I applaud the author for his dedicated research and fact-based analysis." Arnold forces us, in the interests of truth, to focus a little more intensely than we might like, on a few of the more uncomfortable of these facts.